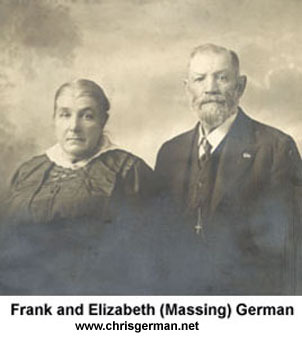 "Frank S. German, a well known farmer and stockman of Grand Prairie township, was born in Buffalo, New York, February 12, 1849, a son of Bacillius and Gertrude (Sager) German, both of whom were natives of Baden. Frank S. German attended school in Stark county, Illinois, and remained upon the home farm until he reached the age of twenty-two years, when he began farming on his own account in Peoria county, Illinois. The first land that he ever owned was a tract of eighty acres which he cultivated from 1871 until 1885. He then sold out and removed to Platte county, Nebraska, on the 28th of November, 1885, establishing his home in Burrows township, where he purchased two hundred acres. He lived upon that farm on section 2 for eighteen years and carefully developed and improved the place, which in 1903 he traded for two hundred and forty acres of land on section 4, Grand Prairie township. He removed to that farm and is living there today. He cultivates it all with hired help, carrying on general agricultural pursuits and also making stockraising a feature of his business. He feeds both cattle and hogs and also breeds a good grade of stock. In 1905 he erected a new residence and he has a farm equipped with many excellent improvements and modern accessories. Aside from his farming interests he is a shareholder in the Farmers' Elevator Company of Humphrey. On the 16th of November, 1869, Mr. German was united in marriage to Miss Elizabeth Messing, a daughter of Matthew and Elizabeth Messing, both of whom were natives of Germany. Emigrating to the United States, they took up their abode near Peoria, Illinois, and there purchased a farm on which they spent the remainder of their lives. To Mr. and Mrs. German have been born the following children: Gertrude, who is deceased; Katie, who is the wife of George Fehringer, a farmer of Grand Prairie township; Mary, the wife of Joseph Fehringer, who is engaged in the livery business at Rockville, Minnesota; Bacillius, who wedded Miss Annie Wemhoff and follows farming in Grand Prairie township; Margaret, who gave her hand in marriage to William Bender, an agriculturist of Granville township; Christina, who is the wife of Frank Ternus, a farmer of Humphrey township; Barbara, who is the wife of William Braun, a merchant of Humphrey; Matthias, who wedded Miss Annie Braun and is an agriculturist of North Dakota; Leo, who married Miss Annie Hamling and follows farming in Humphrey township; Eddie, who is at home with his parents; and a daughter who died in infancy. Mr. German has fifty living grandchildren and three are deceased. Politically Mr. German is a democrat and has served as road supervisor of Burrows township for eighteen years, a fact which is certainly indisputable proof that he has been a capable and efficient officer. He belongs to St. Mary's Catholic church of Grand Prairie township, of which he has served as a trustee, and he is a member of St. Joseph's Men's Society of that church. For thirty years he has lived in Platte county and throughout the entire period has been identified with its farming interests. He has never been afraid of hard work and his close application and persistency of purpose have been salient features in winning for him the success which is today his." 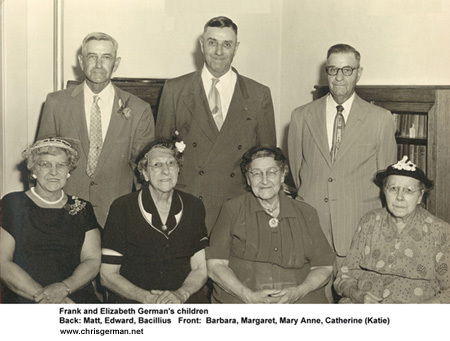 "Frank German, the oldest of the eleven children of Basilius German and Gertrude Sager, was born on February 12, 1849 at Buffalo, New York, where his Father was conducting a six loom shop for weaving cloth. The family soon moved to a farm near Niagara Falls, but in 1852, the family went to Stark County, Illinois to take up farming. It was in the local school there that young Frank received his education, and then helped his father farm until he reached the age of 22. He also worked for a short time in the coal mines on his father's farm, and for 3 months helped build the railroad which ran nearby. At the age of 22, he began to farm for himself in Peoria County, Illinois. By that time he had married Elizabeth Messing. The ceremony took place on November 16, 1869 in his parents' home near Princeville, since there was no Catholic Church nearby. A priest came from some distance for this occasion, since it was to be a double wedding. Frank's sister Fredericka was married at the same time to George Heinz. 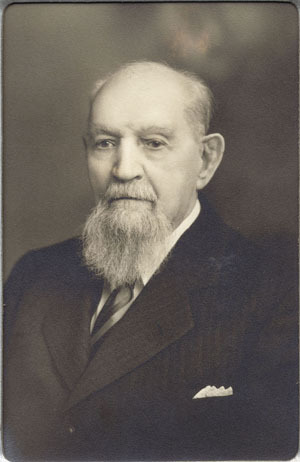 Mr. German owned 80 acres in Peoria County which he farmed from 1871 to 1885. He sold this land, and on November 28, 1885 he moved with his family to Nebraska, where he bought 200 acres in Burrows Township. He traded this land in 1903 for 240 acres in Grand Prairie Township, just east of St. Mary Church. In 1905 he erected a fine house on this property. He was a feeder of cattle and hogs, a shareholder in the Farmers' Elevator Company of Humphrey, and served as road supervisor of Burrows Township for 18 years, and was a trustee of St. Mary Church. Mr. and Mrs. German farmed for many years before they retired to Humphrey, Nebraska. It was here that Mrs. German died on December 22, 1928. Mr. German lived on in Humphrey for 4 more years, and then made his home with his son, Leo. He died on January 20, 1941, one of the oldest men in the Community."